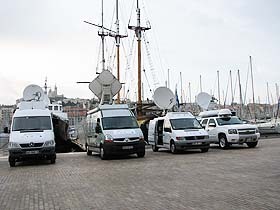 Films du Soleil supplies satellite transmission trucks to Tunisia. In the recent elections in Tunisia, European broadcasting organizations played a part in helping Tunisian TV achieve nationwide coverage. Under the guidance of Jean Réveillon, special adviser to the President of France Télévisions and President of the CMCA (Mediterranean Centre for Audiovisual Communication), large amounts of broadcasting equipment were sent over to Tunisia along with specialists to provide training. - EBU (European Broadcasting Union), German television ARD, the cultural council of the Union for the Mediterranean and Films du Soleil. Films du Soleil's Jacques Hubinet said, "At the request of the Tunisian TV managers, we examined the possibility of achieving the broadest possible coverage from the south to the north of the country on the day of the elections, October 23rd, as well as the following day." He added, "As a member of the CMCA, we as Films du Soleil were convinced of the merits of this aid and gave our support by offering a 50% discount on the services we supplied to the operation." Amongst the equipment provided by Films du Soleil were four satellite transmission trucks and two flyaways which were deployed across the country. The operation was organised by the CMCA and the EBU, co-funded by ARD, the Union for the Mediterranean and Films du Soleil. 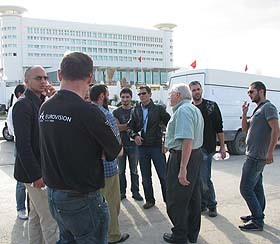 Jacques said, "Arriving in Tunis we had the pleasure to meet our colleagues from Turkish TV and Algerian TV. And everywhere we went we received a warm welcome from the Tunisians. We heard only the word 'welcome...'." "The operation went perfectly to the nearest minute," said Jacques, "thanks to the work of Tunisian Television conducted by Abd El Aziz Touati and the management of the EBU represented on the spot by Amin Hafnaoui. Our team was composed of two production managers, one in Tunis - wizard Amin Hafnaoui and assistant Paul isnard - and myself in the south in Tataouine. The transmission technicians were David Hernandez, Gerard Plendoux, Denis Reymondon, Christophe Donnini, Antoine Zaro Goni and Anthony Rio." Jacques added, "All of us have memories of joy and kindness which justified our presence in Tunisia."